It was a beautiful Saturday. Cool yet sunny, not a drop of rain in sight. 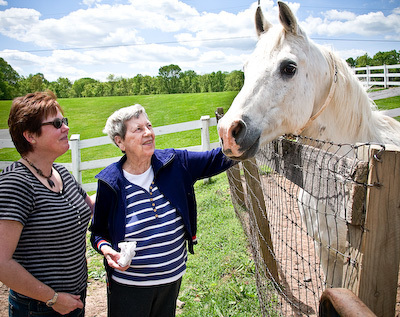 I had been searching for interesting things to do with Mom, and I came across the Ryerss Farm for Aged Equines in Pottstown, PA. 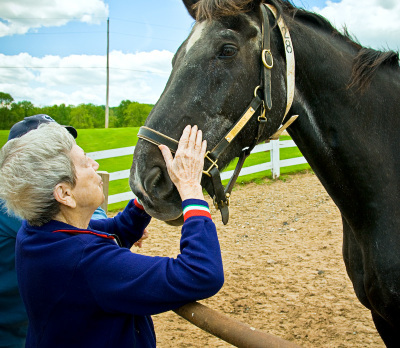 This non-profit organization, founded in 1888, cares for elderly and abused horses. Knowing that Mom grew up on a ranch in Montana and rode horses to school, Bob and I thought a trip to Ryerss might be entertaining for her. Mom was in great spirits when we picked her up after lunch. I made her bring along an old pair of shoes, knowing that we might be traipsing in muddy areas. She was so curious about why she had to bring those shoes along. We told her we were going somewhere new that was a surprise. She couldn't wait to learn where we were going! After a nice drive through the countryside, punctuated by commentary from Laura about how pretty and green everything was, we arrived at Ryerss Farm. There were numerous pastures and many horses were plainly in view. 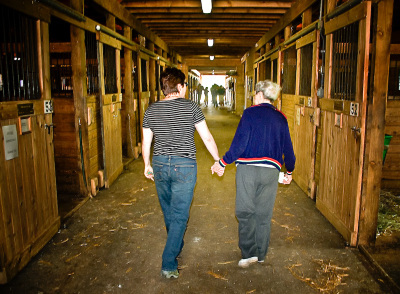 As we drove down the winding lane to the main barn, Mom kept saying "Wow!". Not really knowing what to expect, we got out of the car and entered the barn. Some of the 80+ horses were in their stalls, awaiting some fancy "footwork" by the farrier. As soon as the horses saw visitors, they started to stick their heads out looking for treats. 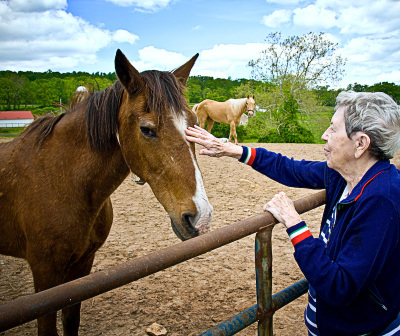 Mom had absolutely no fear of the horses, knowing exactly how to "pet" them and what to say. She was certainly in her element. One of the volunteers spent a lot of time with us, walking us out to a nearby paddock and calling over a bunch of horses, introducing each horse and giving us each one's "backstory". 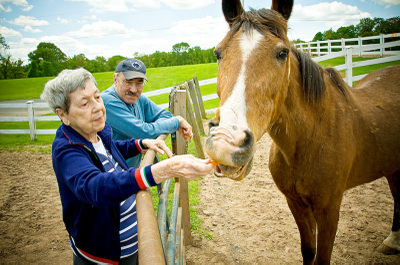 He gave Mom carrots and apples to feed the horses, so she made a lot of equine friends. She was so excited -- she held my hand the whole time but definitely determined where we went (a polite way of saying she was actually dragging me from place to place, she was so excited) and which horses were to get the most attention. She was amazed the horses were so old and yet in such good shape. Each one received detailed scrutiny and commentary. I wasn't sure how much she'd enjoy this trip, but it was a clear winner. After about an hour on her feet walking on uneven pasture land, she started to get a little tired, so we decided to leave. The most rewarding thing? She looked at us and said "That made me feel young." I guess you can't ask for higher praise than that!